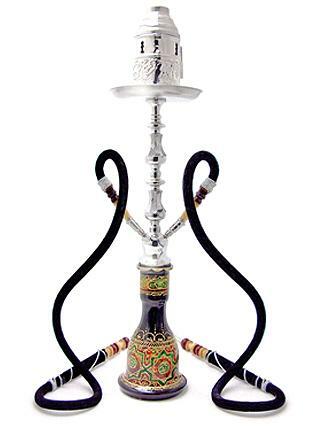 The spectacular Onyx Double Hose Hookah is part of the exclusive SouthSmoke.com Exotic collection. The solid metal stem is expertly crafted with intricate detail and polished to perfection. The large bell vase of this superb hookah is handpainted to resemble stained glass, combining ruby red, emerald green, and sapphire blue layers and elaborately decorated with traditional designs in gold. Sculpted with extra-wide tubing for a truly fulfilling smoking experience, this hookah is one of the the most exceptionally crafted and beautiful hookahs available. Please note that even through a wind cover is pictured, this item is not included with The Onyx.